For over 35 years Farmington Woods Realty has been listing, selling and leasing homes within this community. 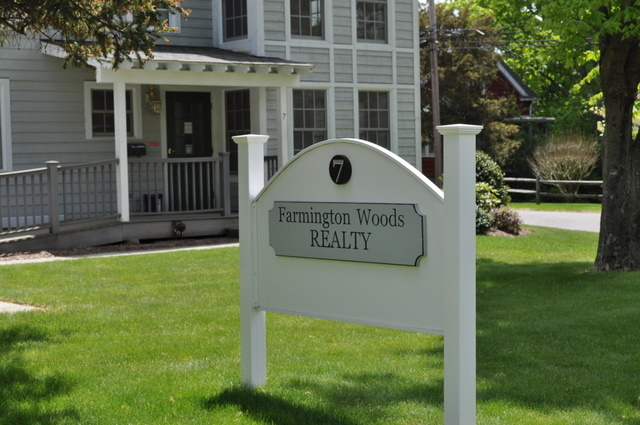 Farmington Woods Realty was originally founded by Heritage Woods Corporation a wholly owned subsidiary of Fidelity Mutual Insurance Company, in conjunction with the development of Farmington Woods. Our focus on the Farmington Woods community gives us a distinct advantage in keeping track of the over 60 unit styles in a community of 1,081 total homes. Today Farmington Woods Realty is a Partnership owned and operated by Realtors George Herman and Brett Eisenlohr. George Herman became the Sales Director for Nolan Kerschner, who, in 1981, began building the new units at Farmington Woods. Previously George had worked for Kerschner in Norwalk, Glastonbury and Westport on different new construction projects. Prior to that time George was working with Century 21 in Norwalk doing residential sales. His real estate career started in 1975. Brett Eisenlohr has been an owner of a unit in Farmington Woods since 1987. Brett is an active Realtor in the Farmington Valley towns and holds the designation of a Commercial & Investment Real Estate Certified (CIREC) agent recognized by the Connecticut Association of Realtors. He started his real estate career as a private investor which evolved into property management and real estate development. Previously, he served three years in the United States Army and twenty five years with the Avon Police Department. Our Company goal is to provide the most comprehensive service possible to our clients. In this context our commitment to our clients requires that we remain knowledgeable about the real estate business in general and about the community of Farmington Woods. We conduct our business within the framework of all State and Federal Statutes and Regulations. We follow a standard set by the Realtors Code of Ethics. When all is said and done we have the privilege of developing a solid relationship with our clients, which makes our job both rewarding and enjoyable. Honor and integrity are the hallmark of any good organization. These traits are a gift to one individually and can only come from within. Money and profit although important are transitory, honor and integrity are not.